Donald Trump continued to dominate the Republican race for US president by causing further controversies in the first debate. The tycoon's refusal to rule out a third-party run drew boos from the audience on Thursday night. And he stood by offensive comments he has made in the past about women. Facing some tough questions from the debate moderators, the candidates tried to stand out in a crowded Republican field. Mr Trump stumbled on his past support for a national healthcare system but his most uncomfortable moment came when moderator Megyn Kelly challenged him on his views about women. "You've called women you don't like fat pigs, dogs, slobs and disgusting animals," she said. He answered by joking that he only said that about actress Rosie O'Donnell and stating that political correctness was one of the country's biggest problems. The crowd became hostile when Mr Trump said he would run as an independent, an admission that enraged Mr Paul. "He buys and sells politicians of all stripes," said the senator. One of the loudest rounds of applause was for Mr Rubio when he mocked Hillary Clinton, who leads the Democratic field. "First let me say, I think God has blessed us. He's blessed the Republican Party with some very good candidates. The Democrats can't even find one." On Thursday, the Democratic Party announced it would hold its first debate in Nevada in October, hosted by CNN. By next summer, each party will have a presidential nominee who will do battle in the race for the White House. Votes will finally be cast in November 2016. About 1,000 grassroots activists packed a ballroom in an Atlanta hotel to watch the Republican debate, and they went home thrilled with the performance. The verdict from the crowd wasn't difficult to pick up. Moderates like John Kasich and Jeb Bush didn't do anything to win them over - even eliciting boos on occasion - while conservative darlings like Ted Cruz and Marco Rubio garnered positive reviews, even if they had limited opportunities to really shine. Donald Trump was generally seen as an amusing sideshow. "He's not a real Republican," said Tarya O'Neill from Madison, Wisconsin. "I hope people know that now". Sandy Rabe of Cincinnati, Ohio, said she liked some of the things he said, "but I hope he doesn't become president". Rabe added that she wished Carly Fiorina, the former business executive, had got a chance to show her stuff on the stage. She is roundly considered to have dominated the earlier debate among lower-tier candidates. There will be considerable pontificating and prognosticating after the debate, but the one thing this campaign has shown so far is that conventional wisdom and educated predictions are more often wrong than right. The Republican field is one of the largest in recent years. 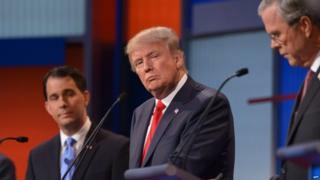 Seven other candidates took part in an earlier debate that featured several attacks on Mr Trump. Former Texas Governor Rick Perry said the former reality show presenter was running a campaign based on celebrity, while former Hewlett-Packard CEO Carly Fiorina mocked him over his Clinton ties. While the debates were going on, Ms Clinton was in Los Angeles for a campaign fundraising event attended by several celebrities, including reality TV star Kim Kardashian and her husband, musician Kanye West. Ms Kardashian tweeted a picture of her and her husband posing with Mrs Clinton, saying: "I got my selfie!!!"